Nighttime dryness evolves naturally as your child grows, and most children are okay with that. If your Bear Cub is concerned, just explain that her body is still growing and it will eventually happen. 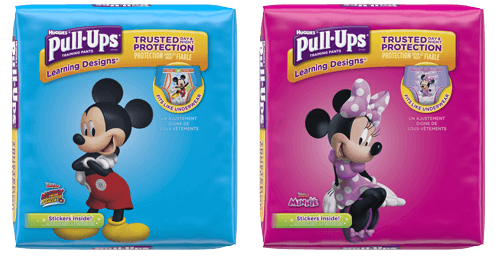 In the meantime, we have our Pull-Ups® Night*Time characters to keep us company. Nighttime training can be approached by emphasizing the independence that Pull-Ups® Night*Time Training Pants give them. Many young children sleep so deeply at night that they’re difficult (or impossible) to awaken. Even if Mom or Dad is standing over them, telling them it’s time to try the potty, that kiddo just will not wake up. So there’s no way that an underdeveloped, tiny signal in the body saying, “hey, sweetie, time to go pee pee,” is strong enough to rouse them. That’s why day training and night training are two completely different animals. Because we’re simply awaiting your child’s physical development, there’s no trick to speed up nighttime potty training, so hopefully you can give your child (and yourself) a break on this one. Take your Bear Cub to the potty before bed to get him into the habit. How will you know when your child is ready to try moving away from using Pull-Ups at night and go into just wearing undies and jammies? If she’s consistently dry every morning, you can talk about her growing body to see if she’s interested in sleeping without Pull-Ups. Is your child over the age of 4 and fully potty trained by day, but still wetting the bed three to five times each week? You are not alone! What’s commonly known as “bedwetting” may actually be a medical condition called nocturnal enuresis, and it affects five to seven million children in the U.S. The best thing you can do for your child is to make him feel comfortable. Let him know you are not upset or disappointed, and consider products like GoodNites®, which can help ease the stress of bedwetting. Talk to your pediatrician for more information about nocturnal enuresis.